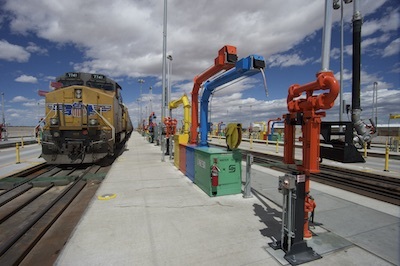 A year after UP’s intermodal terminal and locomotive fueling facility officially opened in April 2014, Santa Teresa has become one of New Mexico’s hottest industrial areas, building upon the momentum that began when the railroad started planning the new facility years earlier. This article by Union Pacific was published May 12, 2015 and is featured on the front page of the company website. Waitress Adria Jaglowitz takes an order at Penny’s Diner in Santa Teresa, New Mexico. Like an oasis among the warehouses that crowd the dusty streets of Santa Teresa, New Mexico, sits Penny’s Diner. The tiny restaurant, right next door to the Oak Tree Inn, was designed to look like a relic out of the ’50s, though it opened just over a year ago. Inside, a waitress is busy hustling tables amid the crowded pleather booths and shiny Formica counters, while a fry cook mans a hot flat-top griddle sizzling with eggs and sausage for the morning crowd. Penny’s assistant manager Irma Alvarez, who also runs the hotel, says the restaurant serves breakfast 24 hours a day, but that the house specialty and customer favorite is still the Monster Burger, which comes with an egg and double meat patties. Business is brisk. The restaurant’s patrons are mostly Union Pacific railroad employees who work at the nearby Santa Teresa Fueling Facility and Intermodal Terminal. In fact, the restaurant and the hotel originally were built to meet their lodging and dining needs. But lately the clientele has become more diverse. Penny’s Diner with The Oak Tree Inn to the right. The restaurant and hotel were built in part to support Union Pacific lodging needs. A year after UP’s intermodal terminal and locomotive fueling facility officially opened in April 2014, Santa Teresa has become one of the state’s hottest industrial areas, building upon the momentum that began when the railroad started planning the new facility years earlier. Jerry Pacheco of the Border Industrial Association helps attract and retain industry to the Santa Teresa area. When it comes to Santa Teresa, there are two Disneylands. One is the Union Pacific facility; the other is computer maker Foxconn, whose factory sits on the other side of the Mexican border just a few miles away. CN Wire Corporation, which opened a 258,000-square-foot facility that employs 300. He said Santa Teresa boasts more than 3.3 million square feet of industrial space, but a year after Union Pacific moved its container business from east El Paso to the new Santa Teresa facility, only 8,000 square feet remained available. “Union Pacific gave us the opportunity not only to recruit existing businesses that came from El Paso, it allowed us to bring in new regional business,” Pacheco said, now in full sales-pitch mode. 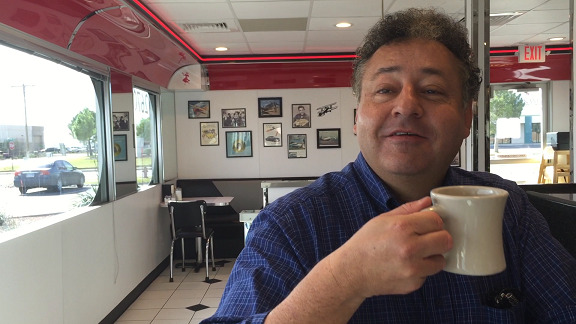 Pacheco showed off Santa Teresa’s rapid growth with a tour of the area in his dusty SUV. The town is like a gigantic industrial park plopped down in the middle of a desert of sand and sagebrush, a grid of massive warehouses and beige office buildings located in a land with no trees. Most of the buildings he pointed to were warehouses. Pacheco explained that many businesses ship raw materials or parts south over the border into Mexico and bring finished products back north to Santa Teresa and its miles and miles of warehouses. 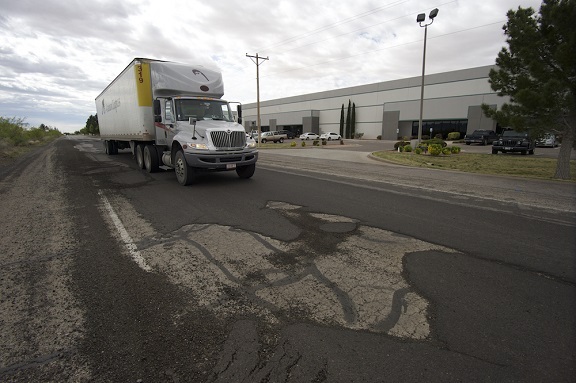 A close look at the surface of Airport Road, a main artery that connects the oldest parts of Santa Teresa’s industrial park. With such rapid growth in such a remote area, there are going to be infrastructure challenges. In 2011, the issue was a lack of water pressure due to a system built 25 years ago with little thought of today’s business levels. “The more businesses we brought in, the more the water system was strained,” Pacheco said. The Business Industrial Association (BIA), of which Union Pacific is a member, worked with the county and state to develop a $12.5 million plan to upgrade the region’s water and wastewater systems. But that wasn’t the only concern. The obvious culprit is the constant stream of big-rig semi-truck traffic that passes to and from the warehouses, the border and UP’s intermodal facility — as many as 800 per day. Pacheco said proposals call for between $5.4 million and $8 million in construction funds to resurface and expand Santa Teresa’s three major roads. 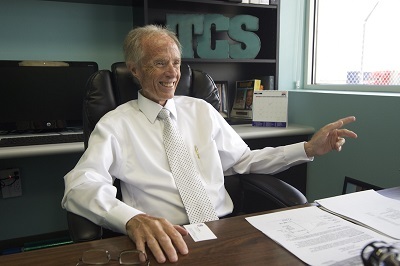 Ed Hazelton, president of Twin Cities Services, said his company began looking for property around Santa Teresa in 2007, anticipating Union Pacific’s move from El Paso. State and local officials are well aware of the problem. The BIA has hosted five interim legislative committees in 2014 that came to “kick the tires in Santa Teresa” and see what’s going on. Pacheco said New Mexico Governor Susan Martinez has visited Santa Teresa 17 times in the past four years for ribbon cuttings and announcements. Ed Hazelton, president of Twin Cities Services, agreed the streets are badly in need of attention. He drives them every day to his office in the heart of Santa Teresa’s industrial park. Twin Cities Services, Inc., a container haulage, storage and logistics company that counts APL, OOCL and NYK among its customers, is a prime example of a business that came to Santa Teresa because of UP’s move from El Paso. “We started looking at property out here in 2007 because we had heard rumblings in those days that the UP was thinking about moving out here somewhere,” Hazelton said. 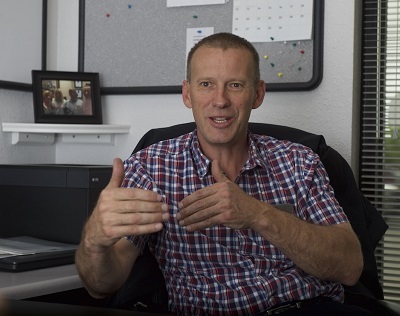 Jerry Groen, operations manager at Southwest Steel Coil, Inc., a company that’s been in Santa Teresa for 14 years. “In the last 12 to 18 months, it’s just a whole different mix,” Groen said of the local economic activity. Tell that to Jerry Groen, the operations manager at Southwest Steel Coil, Inc., whose company began operations in Santa Teresa 14 years ago. His company buys 45,000-pound steel coils shipped via rail from the coasts and upper Midwest to its Santa Teresa facility, where they’re cut into sheets and sold to customers for assembling, usually by companies located in Juarez, Mexico. Even more dramatic changes could be on their way with the creation of the Westpark Logistics Center, a 166-acre development christened just last month. 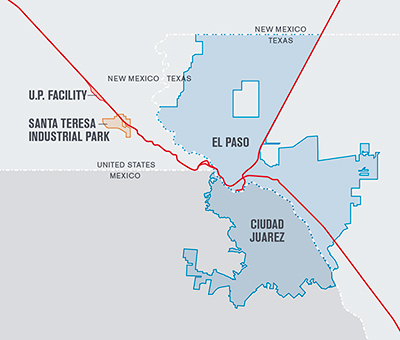 It will be one of the largest industrial parks in New Mexico — and the closest to UP’s intermodal facility — Westpark’s first tenant will be MCS Industries, a U.S. picture frame manufacturer. The company announced the construction of an $11.1 million, 215,000-square-foot facility to replace its existing Santa Teresa facilities. Needless to say, Pacheco is pleased. Not only does he have a new industrial park to sell, but the new MCS development will free up another 200,000 square feet of much needed space in Santa Teresa’s older, sold-out industrial park. Don’t expect the space to be available too long. And while you’re in Santa Teresa looking for your perfect future plant location, don’t forget to stop in at Penny’s. The cheeseburgers are the best in town. One of the locomotive fueling areas at Union Pacific’s Santa Teresa Fueling Facility and Intermodal Terminal.